Susan Boyle's coming to SA! Susan Boyle of Britain’s Got Talent fame is set to perform in South Africa for the first time! Susan Boyle is set to perform in South Africa for the first time! The Britain’s Got Talent superstar is the highlight of the line-up for YOU's sister magazine Huisgenoot's SuperSkouspel on 19 September at FNB Stadium in Johannesburg -- and it'll be her only performance while she's in town. Also part of the line-up are Mango Groove, Freshly Ground, Kurt Darren, Die Heuwels Fantasties, Karen Zoid, Adam Tas, Emo Adams, Andriëtte and Adam. David Kramer and Leon Schuster are also set to perform some of their hits. Huisgenoot Skouspel, the pioneering Afrikaans music concert that’s rocked Sun City annually over the past 15 years, becomes SuperSkouspel this year. Instead of consisting of several shows over two weekends, just one major concert accommodating 30 000 people will be held on Saturday, 19 September, at the FNB Stadium in Johannesburg. This year Huisgenoot has joined forces with kykNet and Big Concerts to reinvent Skouspel. The date of the event has been selected to coincide with Heritage Day (on 24 September) and the Rugby World Cup tournament. “We’ll be celebrating our South African heritage with Afrikaans as the main character,” says Karen Meiring, head of kykNet. The Springboks’ first World Cup rugby match (against Japan), due to start at 17:45 SA time, will be broadcast live on big screens at the stadium to concert-goers. 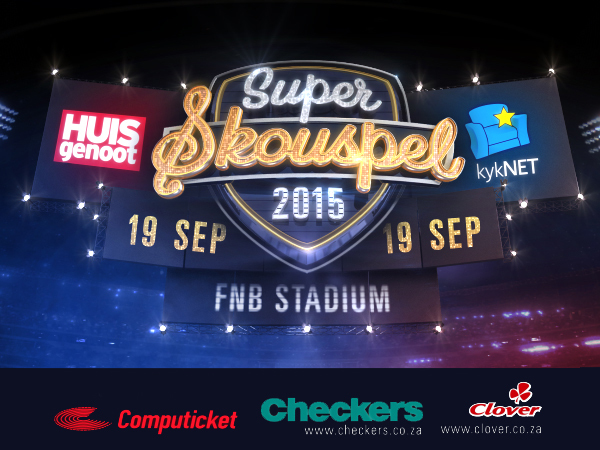 The SuperSkouspel show starts at 20:00 on 19 September. Tickets, available at Computicket from 9:00 on Friday, 26 June, start at R199. Safe parking and park-and-ride options from various parts of Gauteng are also available from Computicket.